This black tribal tattoo is one of the most popular half sleeve tattoos for men thanks to its seemingly simple design and use of free space. On closer inspection, however, the intricacy with which the shapes interact and complement each other works perfectly. Waves are an important part of the Japanese culture and feature prominently in their art work. This tattoo uses large wave shapes over and around a large carp swimming upwards. The tattoo extends slightly above shoulder level towards the neck. This tattoo has a South American religious feel to it with imagery of an attractive woman about to be devoured by a skeleton figure from above her head. The rest of the tattoo has soft, intricate and sometimes symmetrical shapes. 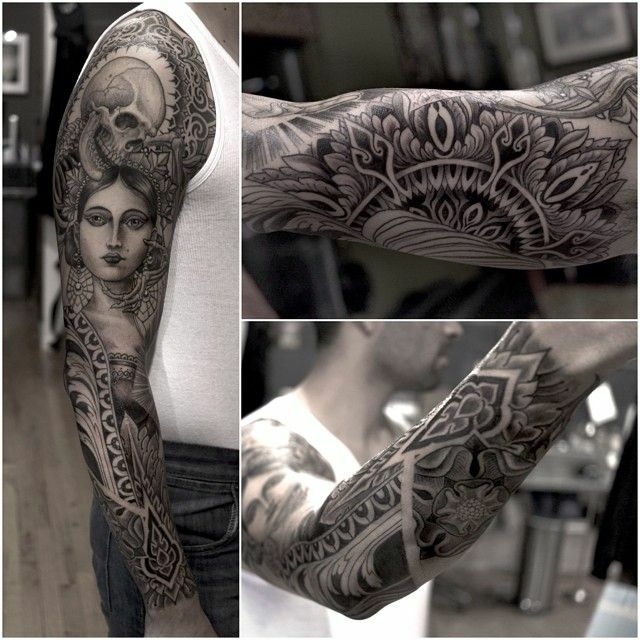 Art-inspired half sleeve tattoos designed for men of this kind don’t get any better. 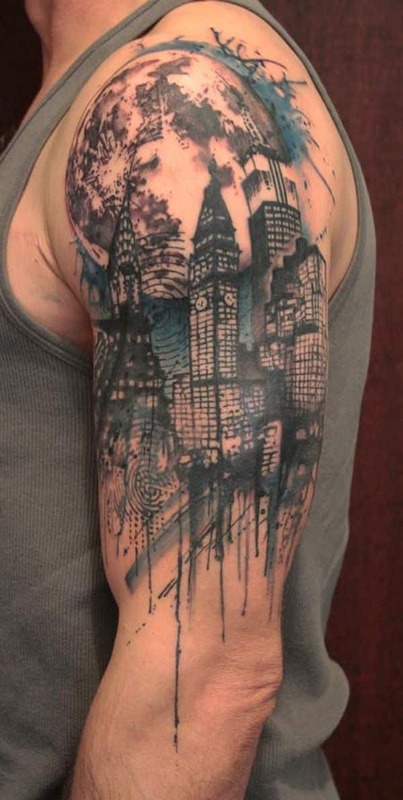 In what looks like an ink drawing of a cityscape at night that has been left in the rain, this tattoo even features ink spots and ink dripping down the arm past the elbow. 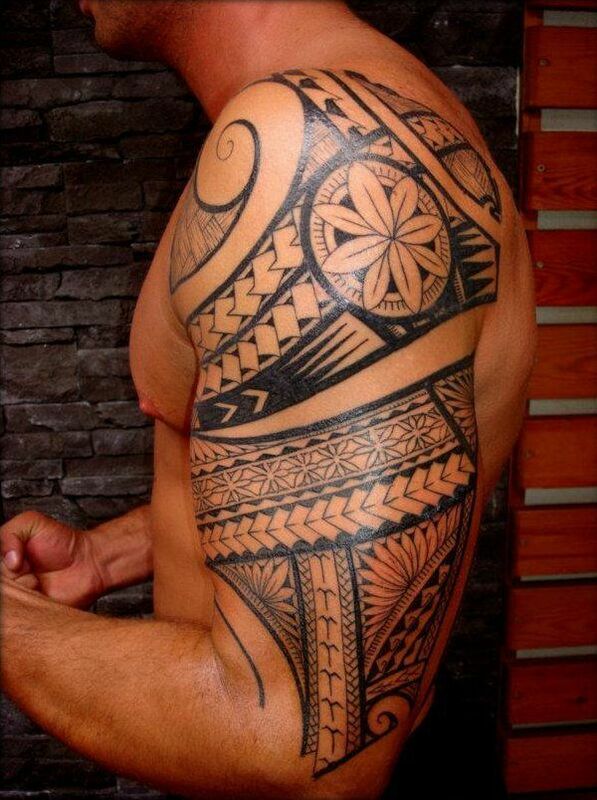 Black tribal tattoo sleeve ideas like this one take the main design shown on the shoulder and replicate it in and around the biceps and below the elbow. Traditional triangle and square shapes fit flawlessly together, while the border completes the design. 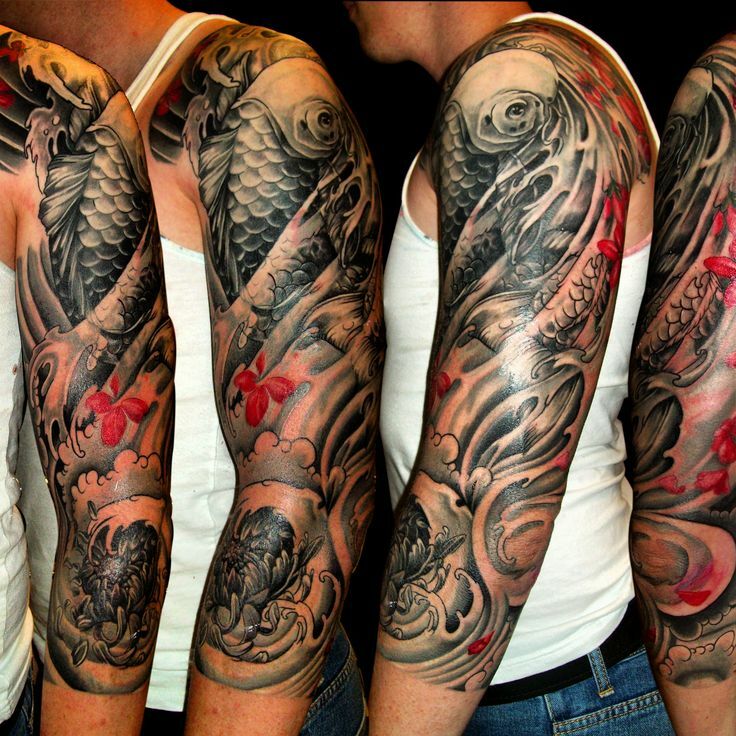 Dragon arm sleeve tattoos come in a variety of colors and designs. In this one, a green dragon has a rather boisterous, playful demeanor and is enclosed with the usual addition of Japanese waves and flowers, with a black background. 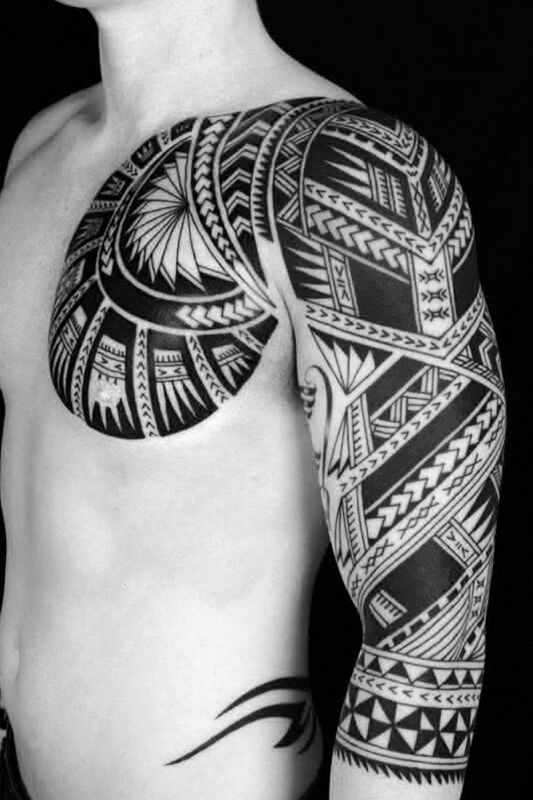 Following the shape of the pectoral with a large, round and expanding design, this tribal sleeve tattoos idea is to flow from the chest and move up over the shoulder and down the arm. Many parts of the tribal shapes are filled in black. Small and large tattoos, and sleeves like this one aim to show what’s happening underneath the skin. 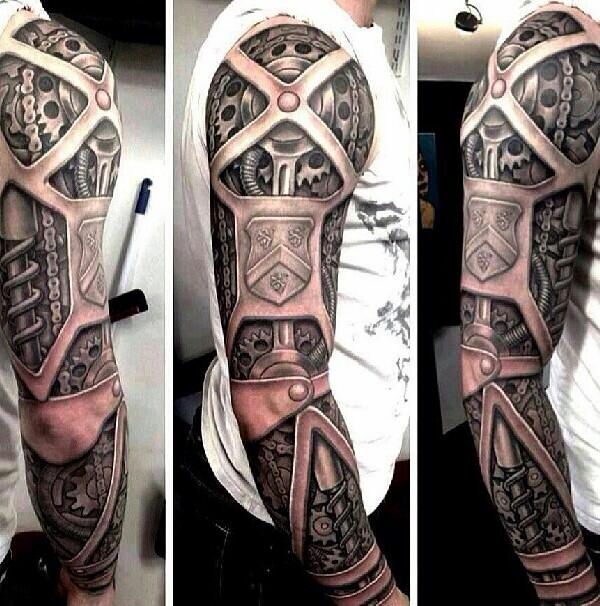 In this one, it looks like the person’s entire arm is made of robotics and mechanical moving parts and chains. No part of the skin is shown. 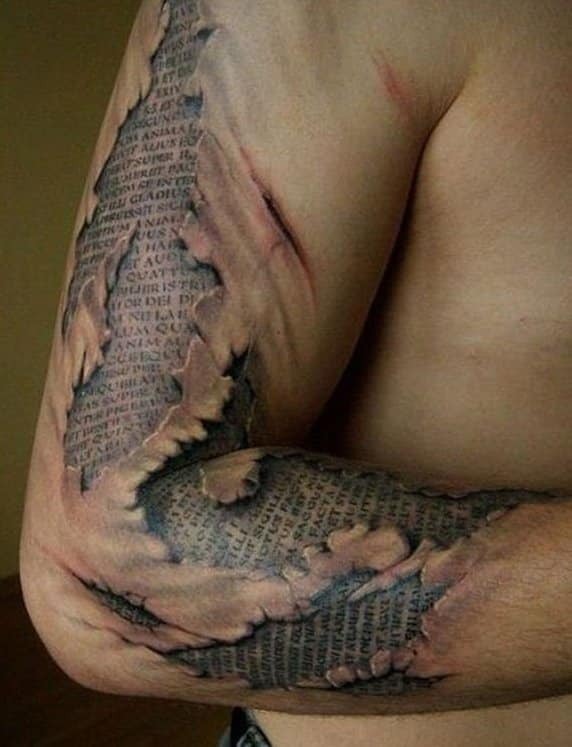 After scratching away the top layer of skin, a passage of writing has been found underneath. From the shoulder down to the forearm, and the addition of extra scratches where the skin didn’t break, it actually looks like areas of the skin have been removed. 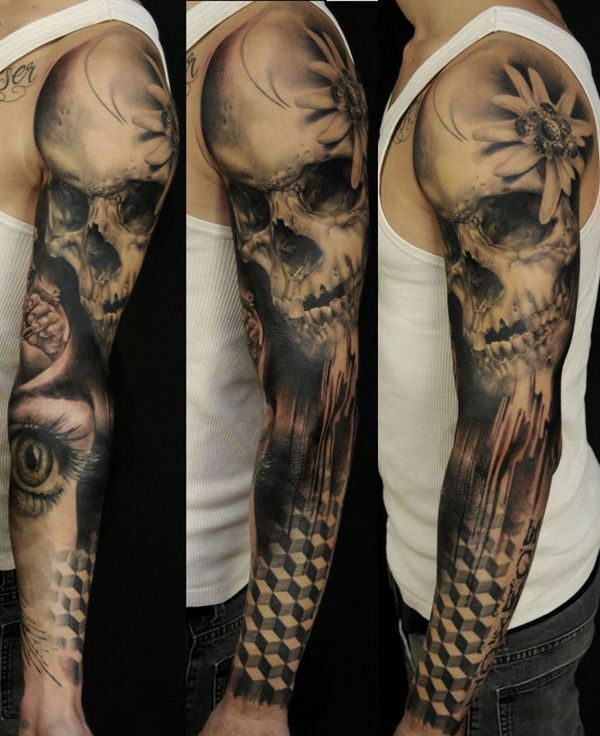 A creepy looking skull and flower finished in black and grey shading covers the entire shoulder. It seems to melt at the lower jaw and develops into a geometric cube pattern below. Meanwhile, the inner forearm features a large, possibly female, eye.